The programme was successfully conducted for administrative and technical staff from Centre for Foundation Studies in Kuantan and Gambang campus. The programme was organized on 28th to 30th September 2018 at Sauk Camp, Tasik Kenyir, Terengganu. 70 staff were involved in this programme. The objective of the programme were to cultivate healthy lifestyle and fostering better ukhuwah. The programme efficaciously expand the involvement of staff in more sporting activities as well as inculcate good physical and psychological practices. In addition, the programme also enhance the team work spirit among CFSIIUM staff. 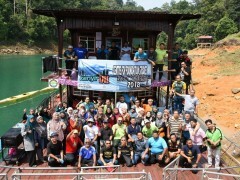 During the whole three (3) days stayed in Tasik Kenyir, all staff including Dean and Deputy Dean stayed in the boathouse. Two (2) boat for male and one (1) boat for female. Staff cooked their own meal and do the activities according to the grouping provided. This was when many staff showed their cooking skills, recreational skills and many other skills. The activities provided include basic kayaking, water confident, kayaking expedition to Herba island, jungle trekking to Sauk waterfall, explorace and water activities. However, not to forget qiyamullail, jamaah prayer and tazkirah among CFS staff to nurture good adherence to Islamic values.